^ Wentworth, G.A. A Text-Book of Geometry. Ginn & Co. 1895. ^ Triangle right iff s = 2R + r. Art of problem solving. 2011-06-11 [2013-08-24]. ^ 8.0 8.1 8.2 8.3 Andreescu, Titu and Andrica, Dorian, "Complex Numbers from A to...Z", Birkhäuser, 2006, pp. 109-110. 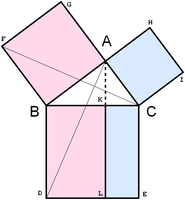 ^ 9.0 9.1 9.2 A Variant of the Pythagorean Theorem. CTK Wiki Math. 2012-10-17 [2013-08-24]. ^ Darvasi, Gyula, Converse of a Property of Right Triangles, The Mathematical Gazette, March 2005, 89 (514): 72–76 . ^ 11.0 11.1 11.2 11.3 11.4 11.5 11.6 Bell, Amy, Hansen's Right Triangle Theorem, Its Converse and a Generalization (PDF), Forum Geometricorum, 2006, 6: 335–342 . ^ 12.0 12.1 12.2 Inequalities proposed in “Crux Mathematicorum”, Problem 954, p. 26, . ^ Posamentier, Alfred S., and Salkind, Charles T. Challenging Problems in Geometry, Dover, 1996.